Rachelle Maisner, who recently transitioned from Sr Analyst to Account Manager at Digitaria, a Google Analytics Certified Partner. New analysts have it easy these days. Back in my day, we have to walk uphill in the snow both ways to get decent enough web reporting. My first blush with web analytics came upon me when I was a marketing coordinator for an advertising agency several years ago. I got the hand-me-down grunt work of pulling stats for one of our client's websites using server logs. Server logs, people. It was painfully slow, and gut-wrenchingly inefficient. So for the sake of my sanity, I started looking into better solutions, and I knew if it could help the client out with more meaningful reporting, that would make me look really good. When I found a solution I liked, I needed to pitch the client for their buy in. That conversation went something like... "I found this great tool, and it's free- we can install it on your website and try out this fast new reporting. It's called Google Analytics." Since then, there are now so many fantastic resources available to budding young analysts. From the Analysis Exchange to Avinash's own Market Motive courses, not to mention GA's recently revamped Analytics Academy, there's a wealth of quality education and training just a click away to anyone who’s willing to learn. 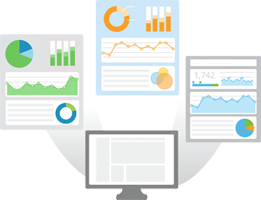 I'm blogging to tell you all about one of my absolute favorite new resources-- a tremendous goldmine of knowledge sharing unlike anything else this industry has ever seen-- Google Analytics’ very own Solutions Gallery. The Solutions Gallery is a free and public platform that allows users to share custom reports, segments and dashboards. It's invaluable resource not only for those that are new to digital analytics, but also for analytics veterans looking for fresh ideas and new approaches. I mean, wow, you can download reports and dashboards from experts all over the globe and instantly apply them to your own Google Analytics account. I was so excited about the Solutions Gallery that I uploaded 8 custom reports of my own to share with the community, and in about a month I had over 1,600+ imports. I have received awesome feedback and gratitude for the custom reports I created, so I am absolutely thrilled to be able to share them here on the Google Analytics blog and showcase them to a wider audience. I hope you find these helpful and I hope they encourage you to not only get more from your data, but to upload some of your own solutions to the Gallery. All my custom reports are organized into four categories. These categories are based on the ABC's of analytics, plus D for bonus points: Acquisition, Behavior, Conversion, and Diagnostics. Visits and Goal Conversion by Traffic Source: Take your traffic source reports one step further by understanding volume & conversion by each channel. This is one way to see how your best visitors are getting to your site. I recommend setting up a goal for “engaged visits”, for this custom report and some of the following reports. When you import this custom report, change Goal One to your engaged visits goal, or another significant KPI configured as a goal. Page Effectiveness: Ever ponder the question, “How is my content doing?” This custom report provides page-level performance, allowing you to discover your top and bottom performing pages using various traffic and engagement metrics. Social Sharing: A four-tab custom report chock full of site-to-social reporting. Tab 1 is the Shared Content Trend, showing how top pages are shared to social networks over time. Tab 2 is Top Shared Content by Network, a first step to discovering what content works for specific channels. Tab 3 is a report on Socially Engaged Visitors, providing a quick profile of visitors that engage in social sharing links. And finally, Tab 4 is Social Outcomes and Conversions, tying social engagement to site goals. Simple E-Commerce Report: A starting point for trending revenue or purchases against visits, with a traffic sources breakdown. PPC Campaign Goal Performance: Analyze paid search performance against goal conversion by search engine. Change goal one completions to your engaged visits goal. This report filters for Google campaigns. To filter for Bing change the source filter for "Bing" or delete the filter to include all search engines. PPC Keywords: Get a paid keyword report with traffic volume, CPC, goal conversions, and cost per conversion. Page Timing: Use this custom report to QA page load timing and reveal problem pages. Switch from the "data" table view to the "comparison" table view, and compare load time to bounce rate, allowing you to view the bounce rate for each page against the site average. Internal and External 404 Report: A custom report to help resolve 404 errors. Includes two report tabs. Tab 1: bad inbound links, and Tab 2: bad internal links. Be sure to change the filter for "page title" to the page title used on your site's 404 page. The following is a guest post from Rachelle Maisner, who recently transitioned from Sr Analyst to Account Manager at Digitaria, a Google Analytics Certified Partner.